Amanda Knox verdict overturned by Italy's supreme court. 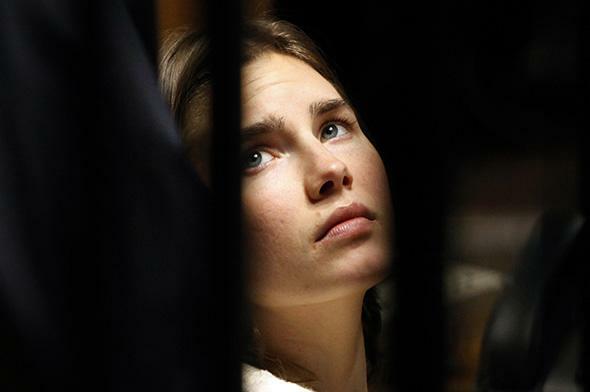 Amanda Knox, the U.S. student convicted of killing her British flatmate in Italy in 2007, looks on during a trial session in Perugia January 22, 2011. Italy’s supreme court has overturned the murder convictions of American Amanda Knox and her former boyfriend Raffaele Sollecito in the 2007 killing of Meredith Kercher, a British woman. Knox and Sollecito, who is Italian, were previously convicted in 2009, acquitted on appeal in 2011, and re-convicted in 2014. The court’s explanation of its decision will be released within 90 days, the New York Times says, adding that “gasps went up among spectators” when the ruling was announced. Further legal action against Knox is not expected. The AP quotes her attorney’s exclamation: “Finished!” The conviction of a man named Rudy Guede, who was also accused of participating in Kercher’s murder, still stands.